Data Abstraction is the process of hiding unnecessary details, exposing relevant information of an object suited for the system under consideration. Best example is an interface. 27. What is the difference between encapsulation and abstraction? Encapsulation hides the irrelevant details of an object and Abstraction makes only the relevant details of an object visible. Inheritance is the capability of a class to use the properties and methods of another class while adding it's own functionality. It enables you to add new features and functionality to an existing class without modifying the existing class. 29. What is superclass and subclass? 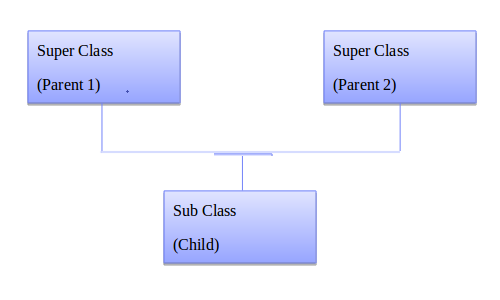 A superclass or parent class is the one from which another class inherit's attributes and behavior. 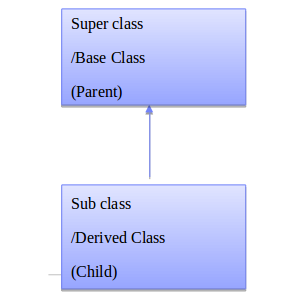 A subclass or child class is a class that inherit's attributes and behavior from a superclass. 30. What are the types of inheritance? 31. What is single inheritance? Subclass is derived from only one superclass. 32. What is multiple inheritance? Polymorphism is defined as the ability of an object to take multiple forms depending on their type or class. The best example of Polymorphism is, invoking derived class methods through a base class reference at run-time. 34. Describe method overloading with example? Example of Method overloading is as given below. 35. How to identify starting method of a program ? 36. How do we access data members of a class in java? Dot Operator(.) is used to access the data members of a class outside the class by specifying the data member name or the method name.